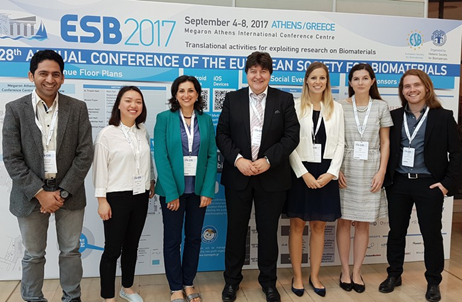 HyMedPoly researchers and supervisors participated and presented at the 28th Annual Meeting of the European Society for Biomaterials (ESB2017) in Athens, Greece. The week-long conference (September 4th-8th, 2017) was attended by approximately one thousand delegates, setting itself as one of the most important events of the year in the field of biomaterials. The theme of this year ESB meeting was “Translational activities for exploiting research on Biomaterials”, a chance to discuss prospective biomaterials and their role in modern medicine. This aspect is not only an element of debate for the future of biomaterials worldwide, but also a key point for HyMedPoly, a programme that aims at the successful training of new specialists able to operate in both environments and create durable connections between them. Furthermore, ESB2017 was a great overview of the state-of-art approaches in bone tissue engineering, drug delivery systems, wound healing and cutting-edge manufacturing methods (such as additive manufacturing, electrospinning and bio-printing). Ethical issues in healthcare, such as the role and importance of in vivo studies, were also hot topics. Prof Aldo R. Boccaccini (Friedrich-Alexander University Erlangen–Nuremberg) attended the conference as member of the Council of ESB. He co-organised and chaired the scientific session “Biomaterials for Biofabrication” in which he presented an invited talk. In addition, Prof Aldo Boccaccini (Friedrich-Alexander University Erlangen – Nuremberg), Prof Ipsita Roy (University of Westminster) and Dr Jochen Salber (University Hospital Knappschaftskrankenhaus Bochum) presented the recent researches of their groups throughout the week. Also, they chaired a special session on Biomaterials for Implantable Medical Device Development. HyMedPoly contributed to the event with four posters. Various antimicrobial strategies developed under the project were presented: ion-doped chitosan (Lukas Gritsch), ion-doped phosphate glasses (Agata Łapa), substituted hydroxyapatite (Muhammad Maqbool) and essential oil-encapsulated polymeric carriers (Binh Thi Thanh Phan). Each presenter is a PhD researcher at the University of Erlangen-Nuremberg, Institute of Biomaterials and seconded to Lucideon Limited, Stoke-on-Trent. The poster presenters received positive reviews from their peers and had a chance to publicise their work and the HyMedPoly project. ESB2017 was also a great melting pot of new ideas, as well as an opportunity to meet new people, network and establish future collaborations. Muhammad Maqbool and Binh Thi Thanh Phan (far left) and Agata Łapa and Lukas Gritsch (far right) with Prof Boccaccini (centre).